A cabinet of curiosities lies deep within Ny Carlsberg Glyptotek, an art museum located in Copenhagen, Denmark, that’s known for its extensive collection of Greek and Roman sculptures. Within the glass case sits an assortment of noses—some round and squat, some narrow and beaky—each one serving as evidence of how art preservation has evolved over the years, and just how fragile statues really are. Anne Marie Nielsen, a curator of Greek and Roman art at Ny Carlsberg Glyptotek, points to the nose as one of the most vulnerable facial features found on a sculpture, so much so that during the 19th century it wasn’t uncommon for people to replace the missing appendages with replicas chiseled out of either marble or plaster. She says that nearly all of the museum’s Greek and Roman sculptures are missing noses, but unfortunately it’s difficult to attach a specific artist in atiquity to a statue and its, er, nose, since that information has been lost over time. 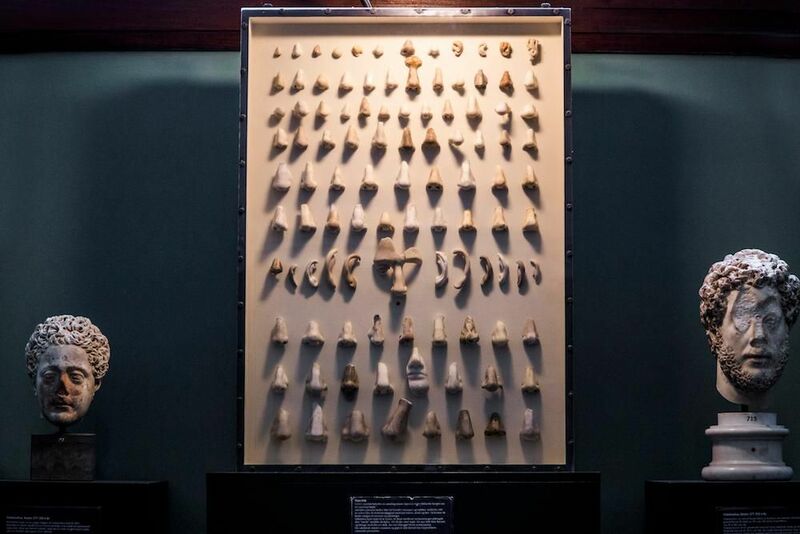 Today the “Nasothek” or nose gallery contains approximately 50 replica noses and is a collection that is truly unique to Ny Carlsberg Glyptotek; Nielsen says she’s not aware of any other museum in the world with a similar assemblage. So why did people perform these “nose jobs” in the first place? Nielsen says the main reason back then was to ensure that sculptures didn’t lose their value. But as with many things in the art world, that school of thought eventually evolved. By the 20th century, as the museum began acquiring more and more pieces for its collection, curators started to remove the fake noses, leaving behind the original stonework. Nielsen says that it’s possible that someone from the museum may have very well created some of the noses, along with other museums hundreds of years ago, since making a statue whole was common practice back then. “Anything that’s not antique, we [now take] off because we want to show the real thing – not what we think it would’ve looked like,” she says. Nielsen says that the collection has proven popular with visitors, and one of the most common questions she gets asked is how the statues lost their noses in the first place.